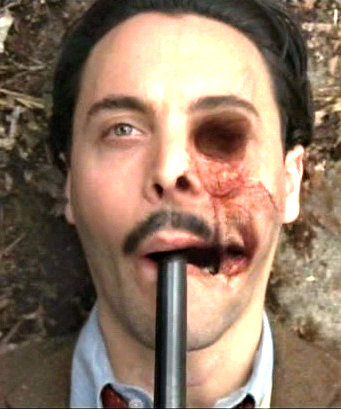 When Richard Harrow from Boardwalk Empire moved in with us, things went pretty well for a while. But then Richard got kind of depressed. We thought it would be a good idea to take his mind of things by giving him something to focus on, some additional responsibility. So we decided to make him our manny. The first thing we learned is this: Richard does not like the term “manny.” He finds it too precious by half and prefers to simply be called a nanny. We try to tell our friends about the “manny” thing in advance because Richard does not have a great sense of humor about this. Or anything else. We have seen Richard be tender and kindhearted with other children, so we are reasonably confident that placing our own child in his care is a safe option for everyone involved. When we are around, Richard treats our child with enormous care and respect. Is Richard capable of genuine human love, at least in the way that we understand it? We’re not sure, but if so, we imagine he might even love our child. We certainly believe Richard would protect him with his life, like a Secret Service agent or like Kevin Costner’s character in The Bodyguard. We debate amongst ourselves whether or not to install a NannyCam for those times when we are not around. We are of several minds about this. We are a little worried about Richard’s “dark” moods and would like a little extra verification that he is not surrounding our son with negativity. Or killing. But we also know that trust is a cornerstone of every important relationship and we think it’s important that if we trust someone with our child we trust them fully and without reservation. We are also concerned that Richard would find the camera and perhaps commit acts of grotesque violence in the wake of this seeming betrayal. Richard is not the best teacher of reading and writing. We have found him reciting his own bizarre, macabre poetry to our child. And as much as we would like to think the poems are no different than letting our child watch a Tim Burton film, we have some reservations. Richard does not seem particularly skilled at mathematics, either. But, hey, that’s what school is for, yes? The nanny’s primary job is not to educate but to care and guide. Richard is a wonderful scrapbooker, though. Our child has built an immense collection of scrapbooks already, each with its own theme, style and unique vision. Watching Richard lovingly cut out pictures from Southern Living or carefully apply a die-cut sticker to a page, we cannot help but be impressed by his commitment to the form and his knowledge of the industry. The finer points of children’s television programs seem to elude Richard. We overheard him telling our child that Oscar the Grouch is not to be trusted. And we once walked into the room to find our child contentedly watching Yo Gabba Gabba while Richard was curled up on the floor in a corner, his mouth fixed open in a noiseless scream. Our child gets frustrated when Richard adheres strictly to the rules of games. He refuses to play Duck, Duck, Goose with only two people and tries to explain to our child that doing so would undermine the game’s fundamental purpose. When our child — as kids are wont to do, certainly — claims that he should get a re-roll of the die in the game of Life, Richard tells him that there are no do-overs in life or in Life. As you might imagine, our child has asked us why Richard wears his mask. We tell him that some people are so unbearably beautiful that they must shield their beauty from the rest of us so we aren’t blinded by it. But then the next day, Richard reported that our child tried to pull off his mask. So then we told our child that Santa Claus doesn’t visit naughty kids who pull off masks. Richard does not have a good relationship with the other nannies and mommies in the neighborhood. When he takes our child out for a walk on a sunny day, other nannies say hello and try to make polite conversation, but Richard just grumbles and turns his back. We encouraged him to join a local mommy-and-child yoga class as a socializing activity, but it did not go well. We give Richard a generous Christmas bonus but we find him burning the check. We are confused by this. Richard often puts our child’s shirts on him backwards or inside-out.